Hey guys sorry (again) for lack of updates. I'm having my exams now, which basically means that I ain't studying and I'm still here in front of the computer every day for hours at length and too lazy to update. So, as per title. Gonna get a D60 soon. Did I just say, Nikon D60? Yes, it's a DSLR cam. I like photography but my current compact camera isn't very.. versatile. It runs on two AA batteries and each pair lasts only minutes of use. It's a black Olympus FE-310, by the way. On Friday the 29th of May, I am leaving for London with my family and also drop by Paris via Eurostar train that runs in the Channel Tunnels, connecting the British Isles and mainland Europe (France). We'll be there for about 2 weeks. I am gonna get to eat some real British fish 'n chips! Also, a perfect chance to fool around with the D60! 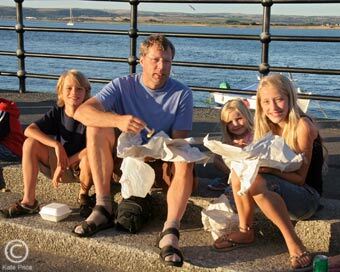 A happy British family enjoying fish 'n chips on the pier. British Family Eating Fish 'n Chips photo taken from Devon-Holiday.